Located only 15 miles from Jaco and Los Suenos, this lesser known sister park to Manuel Antonio is full of wonder and wildlife. Over twice the size of Manuel Antonio, Carara National Park is 52 kms of incredible, unspoiled Costa Rica biodiversity. Carara National Park boasts more primary rainforest than smaller Manuel Antonio, making your private hike through the dense flora and fauna with one of our certified Naturalist Guides a true eco-journey of discovery. Costa Rica’s largest remaining population of wild scarlet macaws. 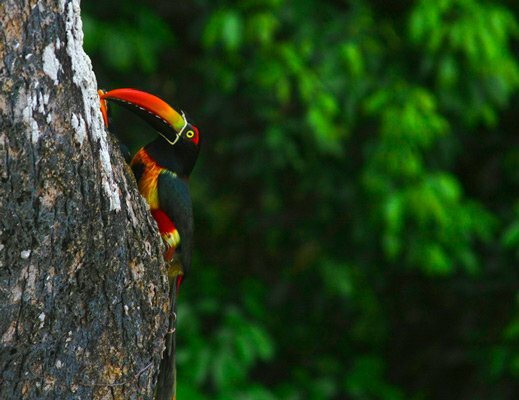 Carara National Park protects the Rio Tarcoles and is home to a stunning variety of rare birds. Our expert guides will point out species ranging from exotic parrots, humming birds, jacamars, parakeets and gorgeous water birds ranging from herons to kingfishers. Along with all of these exciting species, Carara National Park is also home to Costa Rica’s largest remaining population of wild scarlet macaws. Your private day trip to Carara starts with VIP pickup from your local Los Suenos or Jaco Costa Rica hotel or condo. After a short drive north to Carara National park the adventure begins. Hiking quietly through Carara, the park’s incredible wildlife will slowly begin to make itself known. In addition to the incredible exotic bird species, visitors might also see American crocodiles, poison dart frogs, deer, peccaries, red brockets, capuchin monkeys, howler monkeys, and both two-toed and three-toed sloths. Your certified Naturalist guide will expertly lead your group through the dense primary rainforest on an exclusive journey of discovery. Rounding out your exciting Private Carara National Park tour, we treat your group to a delicious, authentic Costa Rican lunch. We recommend that you bring your binoculars and your sense of wonder. Our expert Naturalist guides and Carara National Park's incredible wildlife await you. Make your reservation today! "We recommend that you bring your binoculars and your sense of wonder."